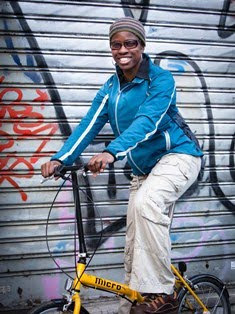 2Wheel Chick: Can-do girls - High Speed Fixie Chase! Can-do girls - High Speed Fixie Chase! 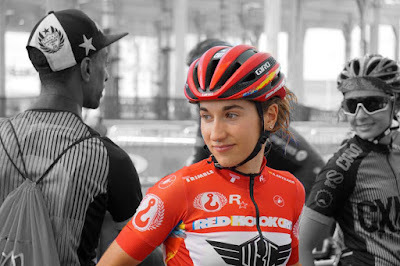 Meet 23-year old Ainara El Busto, track and road racer, but also Queen of Red Hook racing! 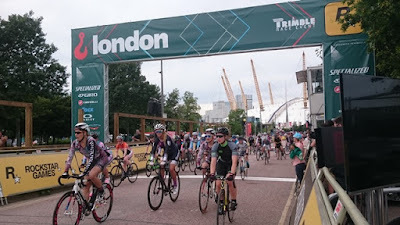 I met Ainara at the Red Hood Criterium when the second round of the series was held on the Greenwich Peninsula in London last month. For those who aren't familiar Red Hook is a series of town centre criteriums held on track bikes. No brakes are allowed, so you really need to have top-end skill to get round the course which can be pretty technical. Or failing that, be prepared to kiss the tarmac a few times! Red Hook first began in Brooklyn, New York, in 2008 and over the years they have added on rounds in other cities around the world. London, which was round two is a relatively new addition, while rounds three and four are held in more established venues at Barcelona and Milan respectively. Ainara has been a real dominant force in the Red Hook series, and was consistently the series leader for 18 months, until the London round. Her party was spoiled firstly by the arrival of London 2012 team pursuit champion Dani King, who obliterated the field. To add insult to injury Ainara unceremoniously exited the race when she got a puncture and has dropped to third place in the rankings. According to Gabe Lloyd, the commentator, this is really big news that Ainara has lost the top spot in the series, and to get back on terms Ainara is going to have to not only win the remaining rounds, but her rivals, new leader Ash Duban, and Vittoria Reati will need to have a bad race or puncture - beware of stray nails and tacks! When I spoke to Ainara on the night I was quite impressed at how gracious she was in defeat, and was able to still speak very positively about her racing and the talents of her other competitors. "I really enjoy racing at Red Hook. There is always a good atmosphere. The girls get on well and we support and encourage each other. Dani (King) is a phenomenal rider and it was good to race against her. It is a shame that I could not properly compete against her. I'm keeping my fingers crossed that things go better for me at Barcelona and in Milan. The support from the crowds in London was great. I started racing in Red Hook in 2014, when I received an invitation to compete in the Barcelona round. At the time I had never heard of this type of racing, so myself and my coach Hector looked into it and thought that this was something that could work well for me. I really enjoyed the race and have carried on doing them since. Coming from a track background meant that it wasn't too difficult for me to get into it. The thing I like about it is that it isn't just about how strong or fast you are, it also depends very much on your bike-handling skills. Also the atmosphere is different from that at a criterium race on the road. It is friendlier and more relaxed. The training I do tends to be road/crit race training, and up to two weeks before the race I was doing interval training. The courses at the different rounds are fairly similar, though I have more fun when it is very technical! For new racers at Red Hook I would say the most important thing is to get used to riding a fixed wheel bike, and after that you can enjoy it!" On the night I also spoke to some of the other gutsy women who pitted themselves up against the best at the London race. The sound of tearing around a technical course on a fixed wheel bike with no brakes is pretty scary. But hearing what the women had to say, I am half tempted to have a go! Perhaps! For those wanting a high adrenaline fixie fix the remaining Red Hook rounds will be held in Barcelona on August 27th and Milan on October 1st. Fast, furious and risqué - Red Hook comes to London!